“The Adventures of Tintin: Breaking Free” is a comic about class war. If that doesn’t sound quite like Tintin’s typical adventures through Orientalist portrayals of the 1930s, there’s a reason why. 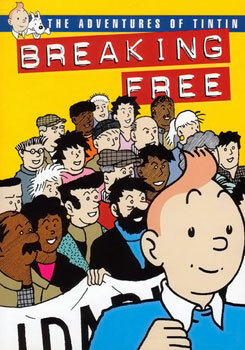 Published under the pseudonym J. Daniels, ‘Breaking Free’ expropriates Hergé’s classic images of the reporter turned adventurer and remakes him as the central protagonist of a general strike. Featuring a cast of familiar faces in entirely unfamiliar roles, ‘Breaking Free’ is as much a blueprint towards revolution as it is an exercise in wishful thinking. Other Spec’s: Softcover, 176 pages, black and white interior. 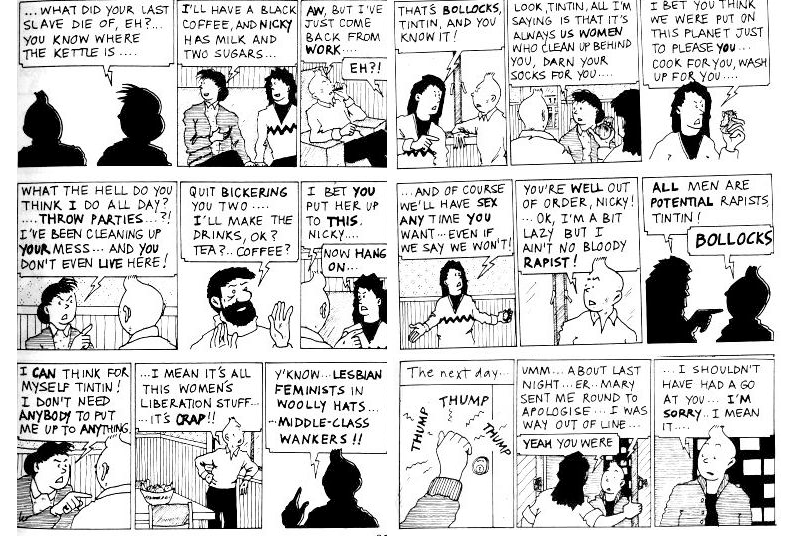 Of central interest is that, for a comic about class war, ‘Breaking Free’ has a lot to say about other struggles: the fighting proletariat are not all gruff blue-collar blokes in flat caps, though there’s no shortage of them here. But the story teems with the diversity of the systemically oppressed: housewives tired of devalued housework, lesbians running away from intolerant homes and elderly being driven out of their communities by gentrification. The idea that all our struggles are connected is intimately threaded through the narrative of the general strike, driving the strike on by recognizing that all are allies in the fight. 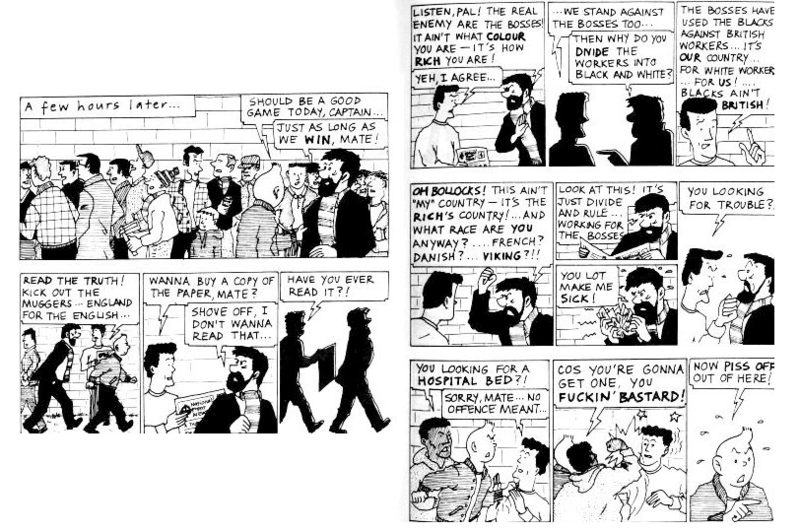 Before the strike begins, Tintin and his uncle (a transformed Captain Haddock) head out to take in a football match. In the crowd outside, a fascist is selling a newspaper. As this excerpt shows, this is no crude caricature of a fascist. Employing language about safety and economic security, the fascist organizer plays on the worst fears of the working class. But the Captain is no stranger to solidarity, and makes the left-wing argument very ably: black or white, it’s us against the bosses. The Captain aptly deconstructs the notion of a ‘white’ race in simple terms, demanding to know which sort of immigrant the fascist descends from. In the sincerity of its depiction of fascism and nuance of the Captain’s arguments, the comic treats the issue of race seriously. Certainly more can be said on the tendency of white men to dominate within even progressive social movements, but at least it addresses the issue seriously. The question of women’s roles in the struggle also crops up, as in this excerpt, and gets a broader showing than race. Tintin treats Mary as little more than a domestic servant, prompting a well deserved dressing down. Mary emphasizes that she’s neither swayed by lesbians nor middle class feminists, debunking those chauvinistic myths about feminism by speaking from her own experience. Rather than be easily persuaded, Tintin flies off the handle, and needs time to cool off before coming around to understanding her point of view. In just a few short pages, the comic covers domestic work, working class feminism and sexual assault. These are not abstract problems for academics to write endlessly on – they are issues affecting left-wing organizing in the 21st century. Tintin later puts in his time as a babysitter so that some of the women can get out to the strike meetings. 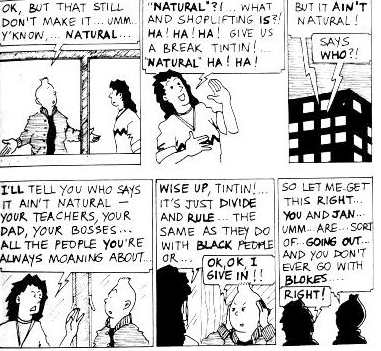 Although Tintin wises up about feminism quick enough, he still has some internalized homophobia to deal with. Rather than coddling him, his squatter neighbour Nicky puts it to him very frankly. Tintin is just as guilty of breaking society’s rules, and all Nicky asks is that he live and let live. If his acceptance seems to come a little too easily when she forces him to admit that homophobia is one more way the rich divide us, Tintin is not completely reformed. But Tintin learns, albeit slowly. When Nicky and the rest of a queer contingent at the strike are hassled by a protester who quickly resorts to homophobic slurs, Tintin turns up out of the crowd to tell him off. The point the comic is making is twofold – first, that gay and lesbian people have as much of a stake in the class struggle as anyone else. Fairly elementary stuff, all told. But the more radical insistence is on visibility – not only are they welcome, but their banner demonstrates public support of the strike, reflecting both diversity and solidarity. Granted that the origins of many liberation movements are in fact decades older, Breaking Free came out in 1992, at a time when intersectionality was still working to get a foothold in leftist organizing, particularly within the realm of labour. It is a great read for anyone involved or interested in progressive organizing.